40 squares puzzle of Calendula herb. 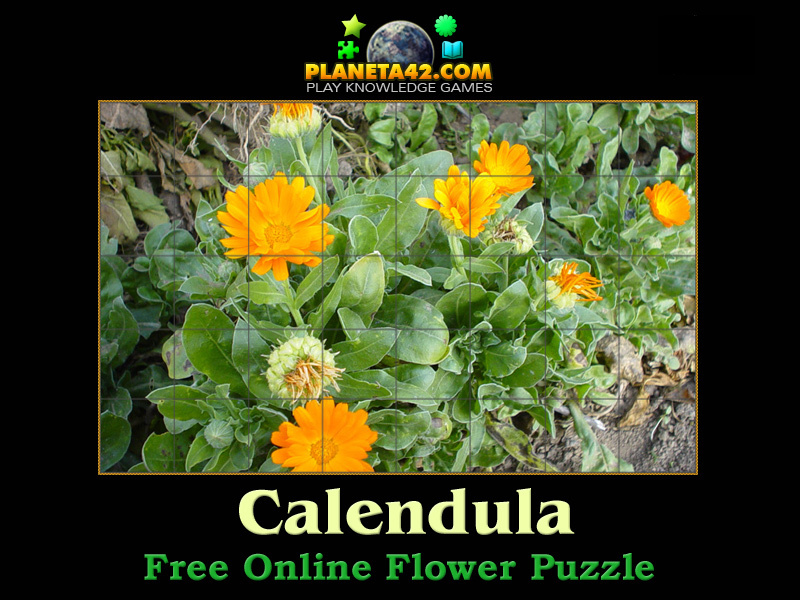 "Calendula Puzzle" is a free online mosaic puzzle with a picture of Calendula officinalis flower. Orange garden marigold. The game will run in most web browsers on average desktop computers, laptops and tablets. This is an exciting way to learn about the Calendula flower. Flash mosaic game. Calendula officinalis, also pot marigold, ruddles, common marigold, garden marigold, English marigold, or Scottish marigold is a plant in the genus Calendula of the family Asteraceae. It is probably native to southern Europe, though its long history of cultivation makes its precise origin unknown, and it may possibly be of garden origin. Labels: Nature Puzzles , Games with Flowers , Puzzle Games , Flash Games , Flower Puzzles , Free Online Games.